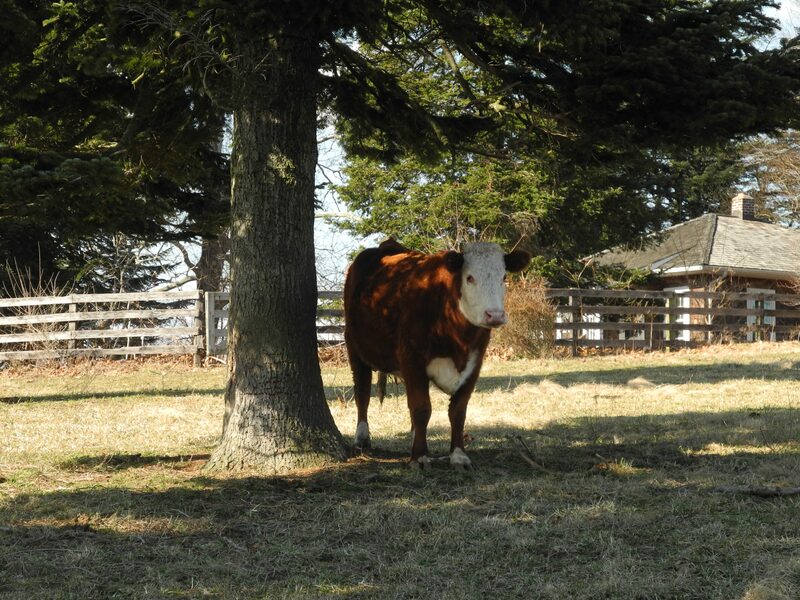 Who’s the New “Moo” at Coverdale Farm Preserve? Two weeks ago everyone celebrated Valentines Day. On the annual day of hearts and affection most folks are wishing for flowers, chocolates, or one of Cupid’s arrows. 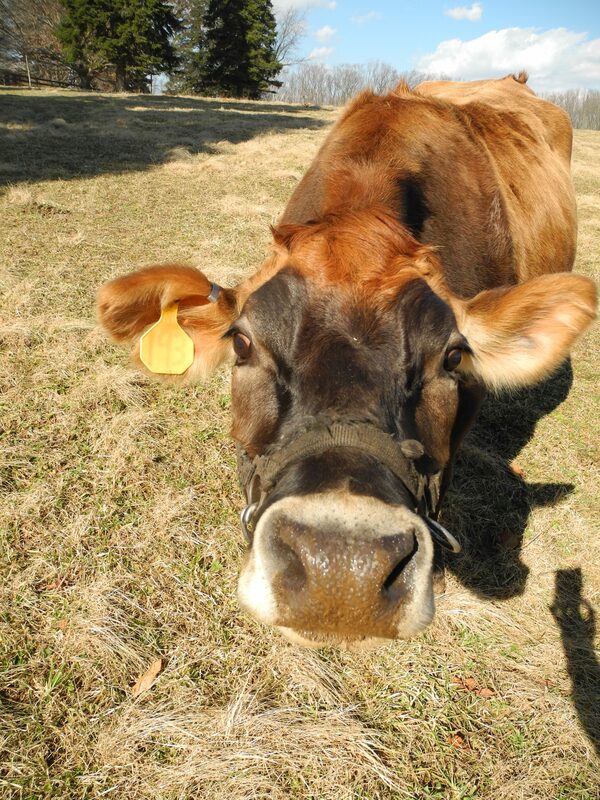 At Coverdale Farm Preserve, we were wishing for a four-legged, red haired, 60-pound bundle of bovine. 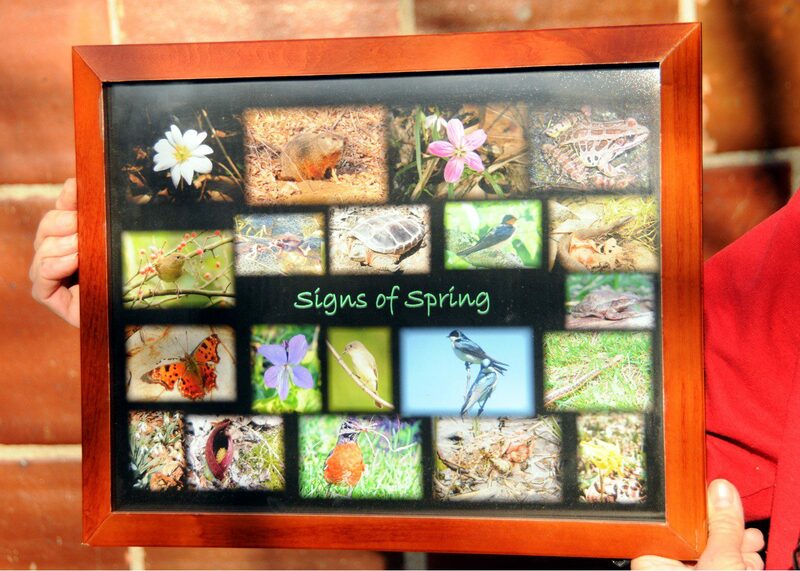 Although February 14th passed us by without a gift, February 15th was full of love! 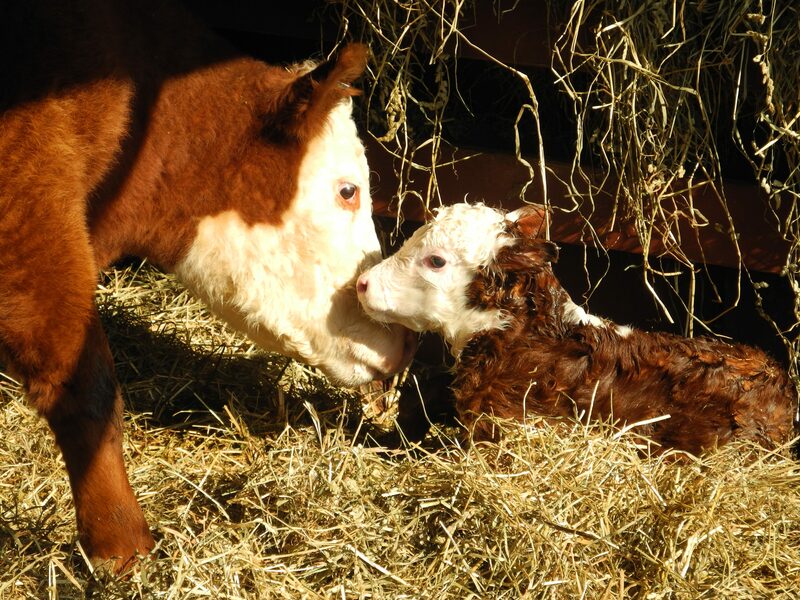 Our beautiful 3-year old White-faced Hereford Beef Cow gave birth to her 2nd calf and her first here at Coverdale. After 9&½ months of pregnancy, she began to show signs of readiness to calve earlier in the week. With a due date of February 14th, farm staff began to patrol the pasture daily, checking for the pending birth. By mid-afternoon on Friday, the cow had situated herself in the small barn located out in the pasture and began to push! Within about 2 hours she had delivered her bull calf (male); cleaned him; nudged him to a standing position; kept a watchful eye as he took his first steps; and stood still as he took his first meal of her milk. We stood close by as this event unfolded to ensure the safety and health of both the mother and her calf. Most farm animals can deliver their young without the assistance of humans but it is important to be present as sometimes there are unanticipated complications. This was a “dream delivery” and we were fully impressed with how quickly our White-faced Hereford’s motherly instincts kicked into high gear. Although it was a “textbook birth” we didn’t fully relax until witnessed the newborn take his first milk, or colostrum. This inaugural meal is critical for two key reasons: to provide protection against disease and stimulate development of the gut. During gestation there is no transfer of these key benefits, so the calf is reliant upon colostrum to safeguard their adaptive immune system and immature digestive system. Colostrum contains pathogen-fighting antibodies and provides concentrated nutrients delivered in low volumes. Unlike a dairy cow, this mother will only produce enough milk for her calf and will provide him with all of the nutrition he needs until he is weaned at about 8 months of age. Once weaned he will graze the 4-acre pasture with his mother and very attentive “Auntie” dairy cow eating grass, taking hay from their outdoor barn, and small amounts of grain in the stone barn during morning and afternoon chores. We invite you to help us take care of Coverdale’s new addition along with the pigs, chickens, and sheep on March 23rd from 4:30 – 7:30pm at the Family Farm Chores & Dinner program (pre-registration required). Also, mark your calendars for Wednesday, May 1st from 12:00pm – 2:30pm. This is the kick-off “Farm Fun Day” for the 2013 season. 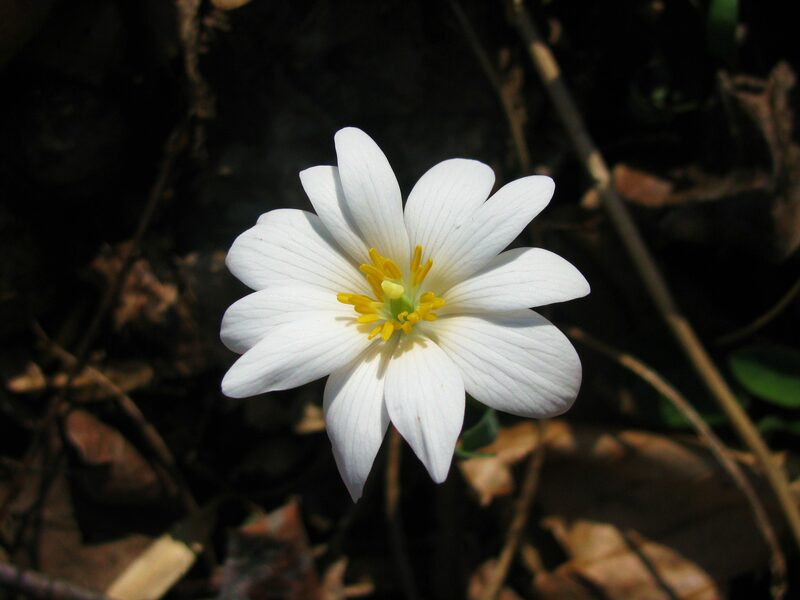 The Delaware Nature Society has designated 2013 as the “Year of Coverdale Farm Preserve.” We look forward to celebrating this “farmtastic” year with YOU!